Normally, baby teeth become loose when the pressure from the permanent tooth below gradually breaks down the roots of the primary tooth. If your child has a loose tooth, encourage him to wiggle, not pull. Typically, gentle wiggling is all that is needed to free a tooth that has lost most of its root and is ready to be replaced. Avoid pulling or forcing the tooth, because that can cause injury to the root area if the baby tooth isn’t ready to come out. Call our Elmhurst office if you have any questions about loose teeth. Dr. Gil Dechavez and our team also have suggestions if the baby teeth don’t become loose on schedule, or if they stubbornly remain in place even after the adult teeth have started to show up. One important note—if your child ever loses a tooth through accident or injury, call us at once. We might need to provide a spacer to give your child’s permanent teeth the proper time and space to come in. 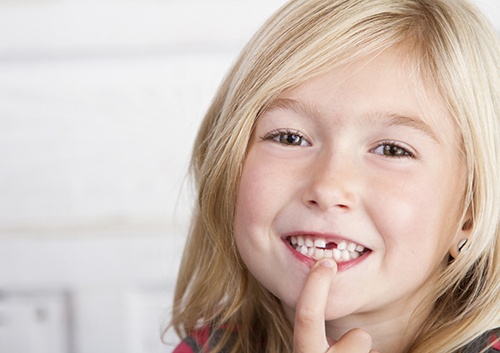 Losing that first tooth is an important moment for your child—and for you. Be prepared to celebrate another milestone together, and always feel free to talk to Dr. Gil Dechavez if you have any questions about this new stage in your child’s life. If your old holiday routine has gotten stale, leave your green T-shirt in the drawer and try one or all of these tips. Don’t be surprised if you have so much fun that you decide to start a new, annual St. Patrick’s Day tradition! 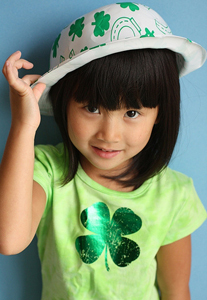 Have a happy St. Paddy’s day from G Smile Dental! At G Smile Dental we know that just about anyone who has taken on the challenge of planning her own wedding could tell you how important the little details can be. Things like having complementary colors, the right location, show-stopping flowers, and delicious food are all a big part of planning your spring wedding. Another little detail that has a big "I do" related role? Your smile. This is a season of new beginnings and beauty. Take the time to bring out your most beautiful smile before the big day. Don’t let your smile hold you back on your wedding. With our in-office teeth whitening, you can be sure that you’ll be more confident and comfortable interacting with friends and family. So remember, when in need of some quality oral care in Elmhurst to think of Dr. Gil Dechavez! We all know that sleep apnea causes many a difficult night. Noisy snoring, gasping for breath, and waking up dozens of times a sleep cycle are the unhappy consequences of Obstructive Sleep Apnea (OSA). What you may not realize is that sleep apnea can make your days just as challenging. Obstructive sleep apnea is caused by an obstructed airway. The throat muscles may relax as you sleep and make it impossible to inhale fully with each breath. Or you may have a physical condition such as a deviated septum, enlarged tonsils or excess throat tissue that blocks the free passage of air into your lungs. As a result, you stop breathing for a short time and often choke or gasp for breath. Your body responds by waking every time you need to start breathing properly again, and this can happen dozens of times each hour you are asleep. The result is that, while you may think you have slept through the night, you have never gotten the deep sleep your body needs to restore itself. As if these reasons weren’t cause enough to find a solution to your sleeping disorder, the longer term results of sleep apnea can be devastating. High blood pressure, heart disease, stroke, dangerous responses to medication or general anesthesia, a higher risk of accidents, and many other serious consequences have been linked to sleep apnea. Sleep apnea doesn’t just ruin your night. If you suffer from any of the daytime problems listed above, please give our Elmhurst office and your doctor a call. If obstructive sleep apnea is the cause, Dr. Gil Dechavez can work with you to find a solution that will improve your quality of life 24 hours a day.